51 by 35.5cm., 20 by 14in. Rossetti painted this subject while working in Ford Madox Brown's studio in the spring and early summer of 1848. It was apparently based on part of Brown's lost subject The Seraph's Watch. 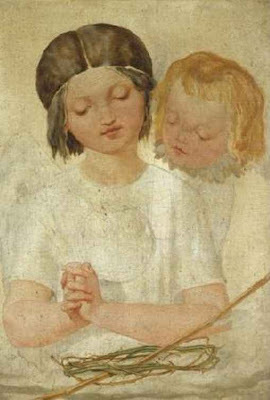 This was probably identical with the work entitled A Reminiscence of the Early Masters, which Brown had exhibited at the British Institution in 1847, and which Rossetti referred to in the letter he wrote to Brown in March 1848 asking to be taken on by Brown as his pupil. painting is unfinished in parts. The wing of the angel whose hands are shown in prayer is indicated with a drawn line. Alastair Grieve describes the work as 'light toned, delicately painted and filled with a sense of primitive, trusting, religious faith. It is narrow in shape and in this and in its predominant whiteness it looks ahead to Rossetti's second major oil Ecce Ancilla Domini!' (Grieve, op. cit., pp.1-2). The present painting was rediscovered after the publication of Virginia Surtees's Rossetti Catalogue Raisonné (1971), and was first seen in a public exhibition on the occasion of the Royal Academy Rossetti exhibition of 1973.